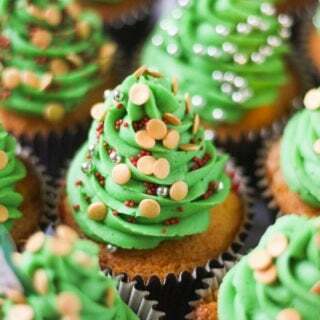 The easiest way to decorate Christmas Cupcakes – simple green icing Christmas trees! Easy and fun for kids. 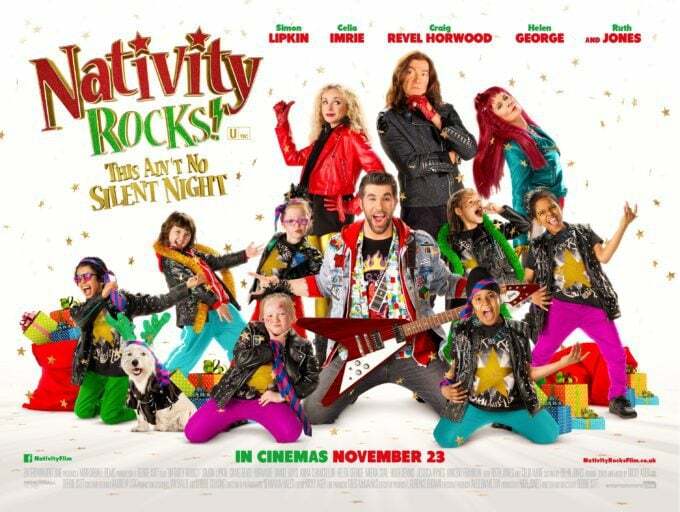 This post is an ad sponsored by the film, Nativity Rocks – in Cinemas November 23! Thanks as always for your support. It’s not even December and there’s all ready plenty of – “careful, Father Christmas is watching you!” going on here. Not to mention the count down to start advent calendars. Please tell me it’s not just this house that’s already feeling festive?! I have made a promise this week, that on Saturday we can watch some Christmas films. 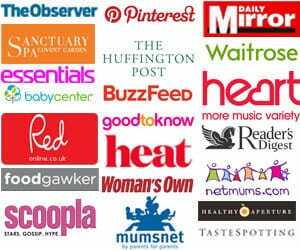 I know that the first on the children’s to watch list will be their favourites – the Nativity films. The Christmas adventures at St Bernadette’s Primary are SO loved in this house. Perfect fun, family viewing by the fire with a hot chocolate at this time of year. When the makers got in touch to tell me that there’s a new film this year, Nativity Rocks, George and Harriet were beside themselves. It comes out on Friday 23rd November, so this weekend will involve a trip to the cinema for us and some new rocking dance moves from George I imagine! The makers of Nativity Rocks asked me to come up with an easy peasy, child friendly recipe inspired by the film. 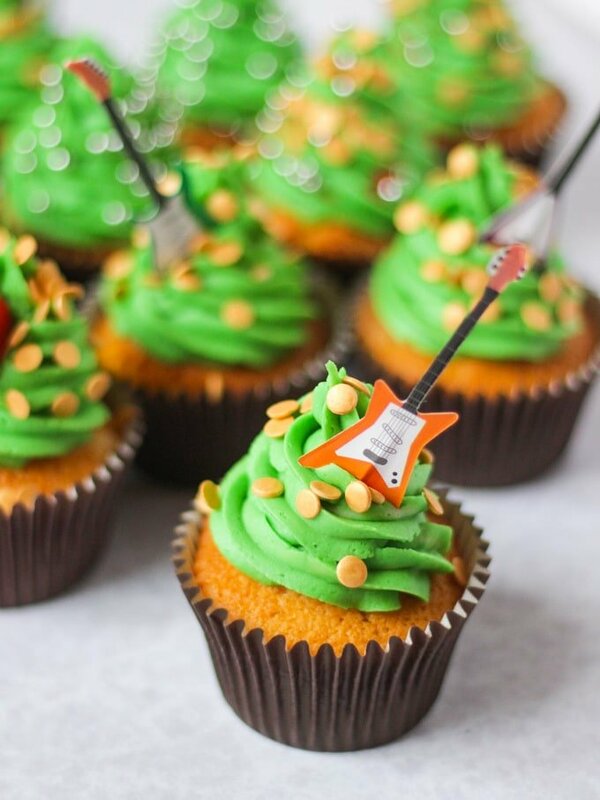 We whipped up some really simple Christmas cupcakes and topped them with cute guitar toppers to give a taste of rock and roll! Please let us know if you make them and what you thought of the film. Hope you enjoy it as much as I think George and Harriet will! Only ever use Gel Food Colour to colour the icing. Liquid food colour will make it too thin and won’t get the correct depth of colour. I used a mixture of holly green and party green gel food colouring, my This is the gel food colour I used to colour the chocolate: Sugarflair Paste Colour – Party Green. 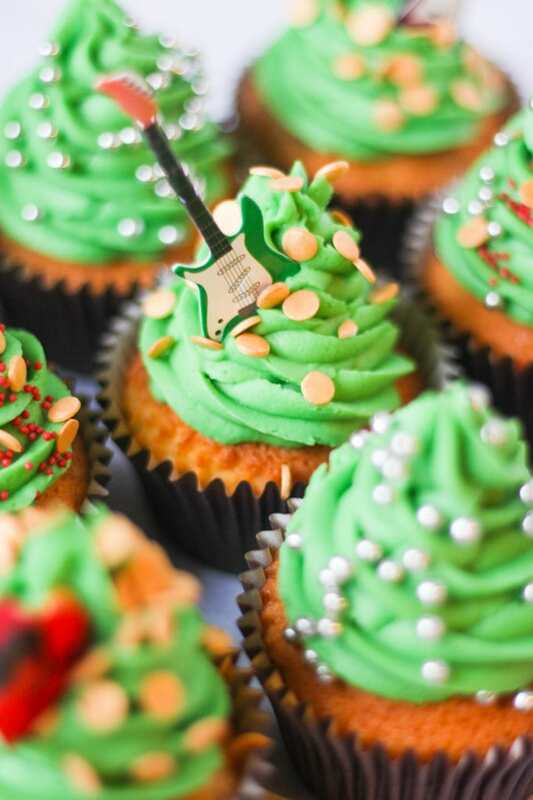 These are the guitar cupcake toppers I used: Guitar Cupcake Toppers on Amazon. To pipe the Christmas tree shape with the icing I used a 1M shape nozzle, also available on Amazon. 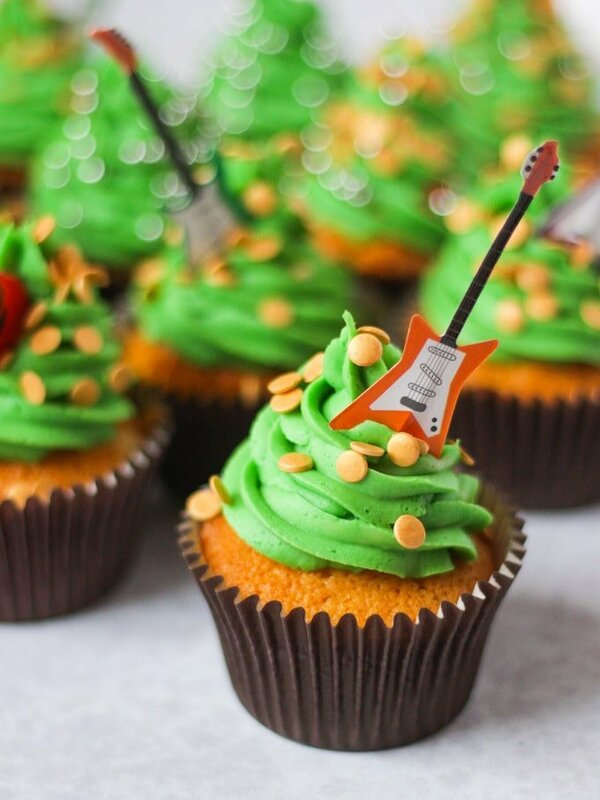 Scroll down for the full recipe and don’t forget, Nativity Rocks will be in cinemas on 23rd November! 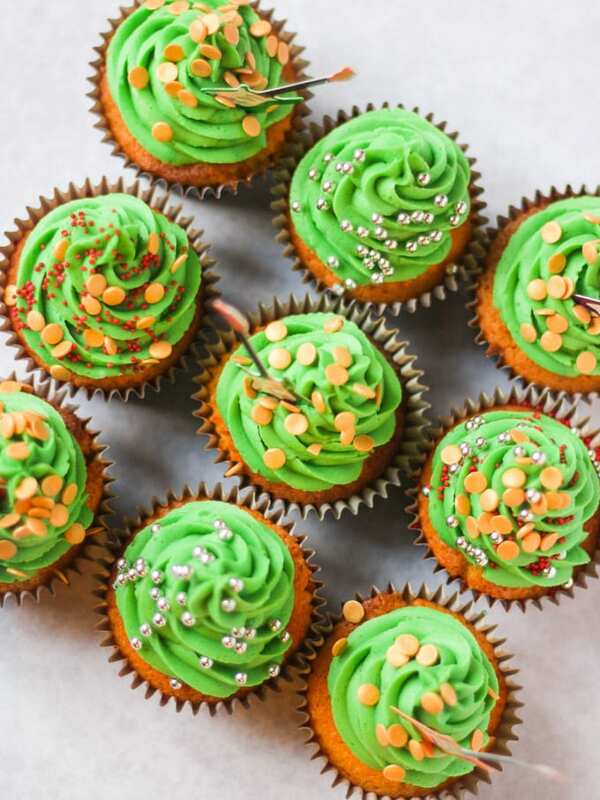 The easiest way to decorate Christmas Cupcakes - simple green icing Christmas trees! Easy and fun for kids. Preheat oven to 180deg fan (200deg non fan). Put 12 cupcakes cases into your tin ready. Cream your room temperature butter with your sugar until its pale, light and fluffy. Beat in the eggs, one at a time, mixing really well after each egg. Don't worry if it curdles slightly, it will come good. Mix in your flour, if you are using a mixer you should do this by hand as it helps to keep the cakes moist. Spoon equal amounts of mixture into your cupcake cases. I use an ice cream scoop as this gives the perfect amount and ensures some uniformity. Bake for 15 minutes approx. You may need to adjust this depending on your oven. The cakes should be golden and slightly bouncy to the touch. To make your icing beat your butter until its, pale, light and fluffy. Beat in your sieved icing sugar. 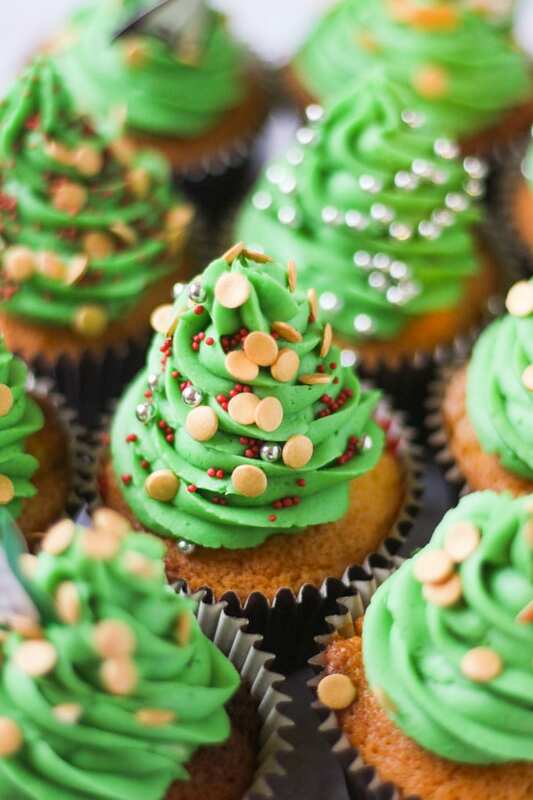 Take your cupcakes out of the oven, when they are cooled pipe your Christmas trees. Sprinkle over Christmas themed sprinkles.